VERDUN, Que. 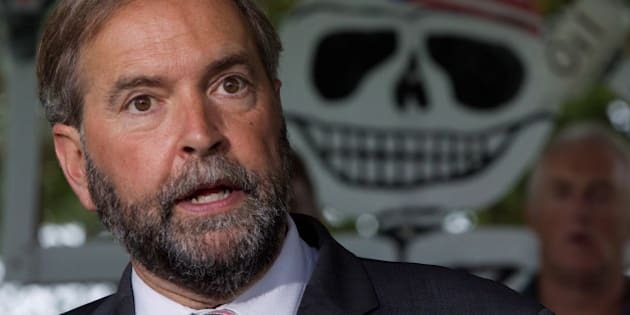 — The NDP needs to run negative ads against the Liberal party during the next federal election, party leader Thomas Mulcair told The Huffington Post Canada. In a lengthy interview to kick off the NDP’s caucus meeting in Saskatoon Monday, Mulcair said it is one of the lessons learned from the British Columbia election in which NDP Leader Adrian Dix blew a healthy lead in the polls and lost the race. The challenge for the NDP is to show Canadians who are yearning for change that the Liberals cannot be trusted to govern on the left, and to highlight the experience gap between him and the Liberal leader, Mulcair said. Part of the B.C. NDP’s problem, Mulcair said, was an early decision to run an exclusively positive campaign. “Anytime they talked about their adversary, they were told, well, you’re not being positive,” he said. “There is a big difference in saying you’re not going to attack somebody personally and saying that you are not going to have a robust debate about the differences between your policy and the history of the other party,” Mulcair said. The party needs to draw people in by saying why they should vote NDP, but also why they shouldn’t vote for the other person, Mulcair added. Although, he didn’t say when any federal NDP ads would run. New Democrats don’t have a history of using attack ads, Mulcair said, and there has been no discussion of doing ads similar to the ones the Conservative Party ran against him after he was elected leader or the personal attacks on Trudeau. But Mulcair said he sees nothing wrong with an ad reminding Canadians that the Liberals are a party of broken promises. “You can go to the Parliamentary library, get yourself a copy of the Red Book (the Liberal party’s platform in 1993), read the part that says (they would scrap the GST) and then you can play the tape of (Jean) Chrétien laughing when he says you didn’t really believe us, did you? And that’s part of the debate in the next campaign,” Mulcair said. The Liberals promised action to address First Nations issues and universal day care; they did neither, Mulcair said. They signed the Kyoto protocol as a public relations exercise, never intending to do anything about it, he added. Although Mulcair will not say the words “Justin Trudeau” — he refuses to refer to the Liberal leader by his full name, only occasionally, Mr. Trudeau, and more frequently, the Liberal leader — it is clear during a two-and-a-half-hour conversation that he is focused on the opponent he will not name. Politics is about accumulating information, otherwise you’re relying on others to relay their experience to you, Mulcair said. “That’s why experience helps,” he added, referring to his three decades of work as a lawyer, civil servant, and provincial cabinet minister versus Trudeau’s five years of teaching and another five in Parliament. “I’ve been at this for quite a while,” Mulcair said. Mulcair has no trouble saying something positive about Stephen Harper — “very strong, determined and structured and very hard working,” but he will not, or cannot, say anything positive about his Liberal opponent. “I honestly don’t know much about Mr. Trudeau; I’ve never worked with the guy. I mean he’s shown up in the House very infrequently. When I’ve heard his speeches they have not been memorable,” he said. “There is not much to refer to in what he’s actually done in his career, and one of the things that does surprise me about him is a lot of people refer to him as being very young, but he’s going to be 44 at the next election, I don’t think that … ” Mulcair said, then he stopped speaking, as if admitting he pays more attention to Trudeau than he wishes to acknowledge. (Trudeau will actually be 43 at the next election if held in the fall of 2015 as expected). Since Trudeau became leader, the Liberals have lead public opinion polls. The Grits rank first in nearly every region of the country, including Quebec, where the NDP holds 57 of the party's 100 seats. Despite widespread praise for his performance in the Commons this spring, Mulcair has not been able to reverse the Liberal momentum. He tries to put a positive spin on that, noting that the NDP is above historical levels in the polls. And the polls, he said, are good in Quebec. Mulcair predicts that the 2015 election will be “an epic battle” between two visions of the country: a neo-conservative approach favouring a restricted role for the state and a more interventionist strategy, in which services to the public are the last thing on the chopping board. The NDP will focus making concrete promises that can be easily measured and contrasted with the Liberals’ failed promises. “What we are proposing to do is actually make life more affordable,” Mulcair said. An NDP government would require that credit cards be offered “at a reasonable rate,” he said. It would increase federal funding for post-secondary education, First Nations schooling and work with the provinces to set up universal day care and pharmacare programs, and hold semi-annual meetings with the provinces and territories to ensure the promises are fulfilled. The NDP leader knows what he needs to do to form a government and is already starting to pave the way. The challenge for the next two years, Mulcair said, includes ensuring that the NDP has a strong ground game in each of the ridings. His MPs are doing a magnificent job and he couldn’t be happier, he said. Membership is up, the riding associations are strong, his MPs are fundraising. The party is already preparing its platform. Mulcair said another challenge is to show in Parliament that the NDP is the only party capable of forming a government. To do that, he will showcase his strongest MPs, naming David Christopherson, Libby Davies and Megan Leslie. He wants Canadians to feel not only that the NDP is a party of principle but that it can be trusted to manage affairs of state. The NDP, for most of its history, has been seen as the conscience of Canada in Parliament, Mulcair said. Now, he wants Canadians to see it as a credible alternative. “We want people to have confidence in our ability to provide good, competent public administration, which might be the world’s most boring election slogan, but it is communicating that … the type of change that we are talking about can’t appear to be more shocks to the system,” Mulcair said. Communicating the idea of making polluters pay a price for polluting is part of that challenge. But people will get it, Mulcair said. Sustainable development legislation would allow Canada to continue with the “extraction industries,” but it would also ensure that future generations aren’t left to clean up the mess. While he has moved the NDP somewhat to the centre this spring by supporting a free trade agreement with Jordan, he is opposed to a trade deal with China and opposed the sale of Nexen to China. He said that, unlike the Liberal leader, he won’t sign commercial agreements with countries that have no rule of law, and no labour or environmental protections. Despite all the Liberal talk, Mulcair said, he considers his opponent in 2015 to be Stephen Harper. Although his goal is a majority, he said, he would work with any willing party if he wins only a minority government. It’s too early to tell what the ballot question will be, Mulcair insisted, but he is convinced voters will be tired of Harper’s Conservatives. The NDP and the Liberals are expected to toy with the theme of change. From the NDP, change you can trust, focused on leadership and experience, perhaps. It’s already a slogan the NDP used during its spring convention in Montreal. “I think it’s about leadership. I think it’s about experience. …I believe that we’ve been showing strong leadership, and experience is palpable and it is a measurable thing. You can read it and say well that’s a type of experience that I want or that type, but I think that it’s a measurable thing. It’s not a question of opinion,” Mulcair said.